Bloggers and businesses in the same niche can use Blog Outreach to benefit each other. I will be sharing tools for identifying influencers and allow us to track the effectiveness of our efforts. One I recommend bloggers join now is PostRank Connect. You may already know about PostRank. This tool offers free Social Media Analytics numbers useful to bloggers and allows businesses to identify the influencers most active in their industries. I must have done something right lately as PostRank Engagement Points keep jumping. The image below shows I am up +33,121 points for February – an increase of 186%. The image above is a snapshot taken from the page below. Click on the images to see larger versions that are easier to read. Sending you to the actual page won’t work because you would have to be logged into my account to access it. These posts provide an instant clue into what is most popular on that blog. If it is related to what your business does or what you write about in your own blog you have found a potential collaborator. 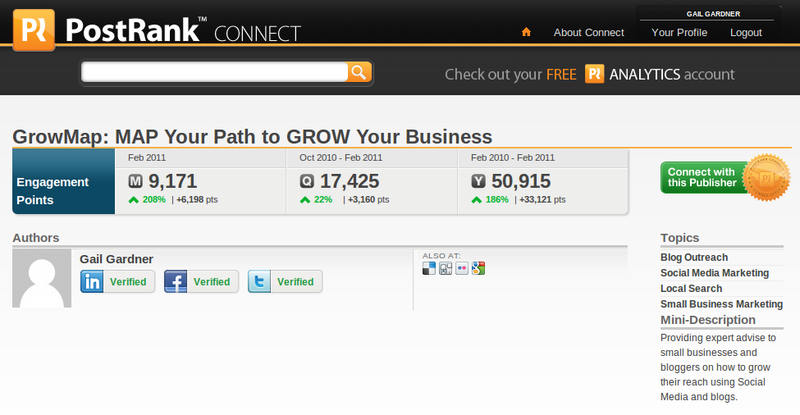 PostRank has plans to make it easy for businesses to connect with bloggers. That feature hasn’t been launched just yet but you can get an invitation to see it as soon as it is available. Once thatfeature is live (probably by March-April 2011), that button will be live. Postrank is pretty cool. It gives even more information to analyse. Use it in combination with analytics. But the main reason for using this is to find collaborators. Good stuff. I hadn’t heard of PostRank before, but I’m curious if this was written before or after Google acquired it. If before, what implications will this have on the functionality and use of the data? Very useful tool, it is very important to be able to have an image of the social outreach of your site, thanks for sharing! That must be new since I registered. I did not run into any language related to competitions or advertising. I have peep into the tool. Good introduction. I only visit to this site to know advancement about the marketing and search engine optimization. Now with the search engines admitting that social media does form part of their ranking algorithm, these statistics will definately be worth our while to monitor. I think postrank will be a useful tool in the future that will help the blog owner to determine what people like to read on their blog and for visitors to take a peek on what they may want to read on the said blog. 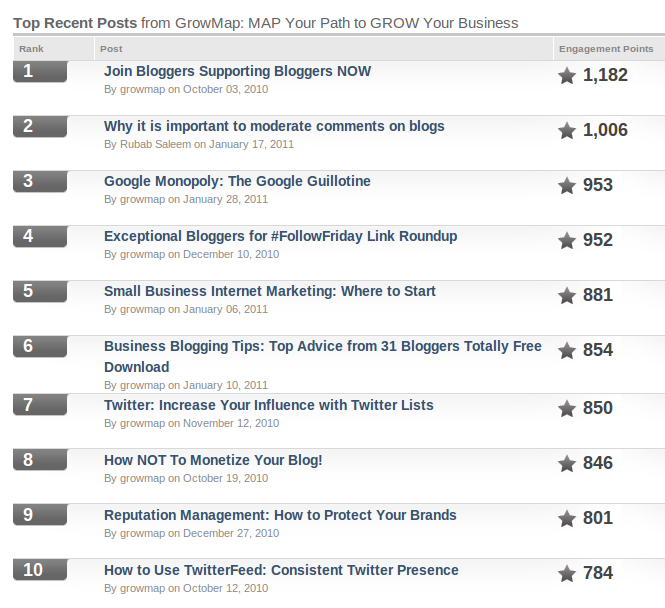 It would be interesting to see if it will become something like an alexa rank for blogs. Christopher Roberts would love you to read ..Kung Hei Fat Choi! Postrank may be a useful tool in order to determine social and authority rank of users so that we can find out to which users and businesses to connect and to get retweets and likes to increase search engine rankings. Hey, thanks for the write-up! We haven’t even launched the business (agencies/brands…) side of things yet. Probably in a month or so. Once we do, there’ll be rather more sophisticated features for finding and connecting with publishers. But you can certainly start learning about publishers’ online presences now. Thanks for taking the time to comment. My blogging collaborators and I like to be in early and often alpha test new solutions. I know that the green button isn’t for notifications, but since that feature hasn’t launched yet it IS the way to get on the notification list for that specific feature. I don’t know of any easier way to let my readers know how to do that right now. I edited that paragraph to explain that more clearly and so it will still make sense once the feature is launched. Thank you for your feedback that led to my improving this post.